A bollard is a short post used to create a protective or architectural perimeter. When installed primarily as a visual guide, bollards guide traffic and mark boundaries. They come in a wide variety of shapes and styles to accentuate or visually stand out in their settings. Bollards can also be constructed to physically block vehicle incursion, protecting people and property. These security bollards may have decorative elements or be chosen to complement the landscape, but their primary consideration is resistance to impact forces. Bollards can be made from almost any material, depending on their needed function, but the most common bollards are metal, stone, cement, or plastic. The term “bollard” first appeared in the Oxford English Dictionary in 1844, describing a post used to attach a maritime vessel’s mooring line. The etymology is unclear, but it is likely it was derived from the word “bole,” meaning tree trunk. Over time, the term has been extended to include posts used to guide pedestrian and vehicle traffic. Although the term is only two hundred years old, bollards have been around for thousands of years. Some of the oldest surviving bollards date from the Roman empire, where carved stone posts were used as tethering posts outside of buildings, and milestones along the sides of roads. Some architectural bollard designs are inspired by 17th and 18th century cannon bollards. Bollards often reflect or enhance the environment they are in. Many traditional styles of bollards today are influenced by seventeenth- and eighteenth-century installations, when it became common practice to make use of decommissioned cannon barrels by half-burying them. These cannon bollards were handy on wharfs for mooring, and inland were adapted to directing traffic and protecting stonework. When the cannon was buried with the muzzle facing up, a too-large cannon ball was often used to seal the cannon against water and debris, creating a distinctive rounded top. The varying shapes of these old cannon bollards still influence bollard styles today. Although marine bollards are still in use, most bollards today are manufactured for traffic and safety applications. In the early 1800s, Amsterdam residents were an early adopter of this trend, as their narrow streets had no curbs or yards. Property owners installed cast iron bollards in front of their homes and businesses to prevent damage from increasing carriage traffic. The city of Amsterdam eventually followed suit, installing cast iron bollards called Amsterdammertje to delineate pedestrian areas. Although now most cities, including Amsterdam, use curbed roadways as a method of traffic separation, the use of bollards is still a very common strategy for defining different areas in the modern city-scape. As vehicles become heavier and more highly powered than early carriages, bollard installation and design has adapted in response. On one side of this equation are flexible bollards that can be hit without damage to car or post. On the other side are security bollardsdesigned to protect buildings and pedestrian zones by slowing or stopping vehicles that hit them. Vehicle attacks in public spaces have led to more interest in these highly impact-resistant bollards. At additional levels of protection, government buildings sometimes install assault-resistant bollards designed to withstand multiple waves of vehicular bombardment. Bollards have become a ubiquitous part of the modern landscape. Planners and architects use them to manage both pedestrian and vehicle traffic, enhance landscape and architecture, light pedestrian pathways, secure and protect buildings and people, and provide bike parking. Bollards are also now being used indoors, in warehouses, for asset protection. A line of R-7535 bollards guide traffic while complementing the architecture of a train station. Traffic bollards are used to guide traffic toward appropriate areas while ensuring clear sight lines and allowing pedestrian access. They can guide cars by creating roadway demarcation, or prevent access to restricted areas like bike lanes, public squares, and traffic islands. On roadways without curbs, they can be used to prevent vehicles straying from the street. Sometimes they are used in association with other traffic calming methods, like speed humps or one-way streets, to prevent vehicles from attempting to avoid other traffic management elements. In many landscapes and properties, decorative bollards are used to define distinct pedestrian areas. A line of bollards around a building may define its perimeter and add architectural flair. Bollards can be used to contain a playground or park, allowing easy access but discouraging its use as a throughway. When linked with chain, a line of bollards can encourage pedestrians to stay on marked paths, without forming a closed barrier that prevents all crossing. Lighted bollards can line and illuminate a pedestrian pathway at night. Solar powered lighting is becoming the most frequently used form of lighting bollard, since each unit functions on its own with very little maintenance. A ring of R-9811 energy-managing solar bollards illuminate a pedestrian zone. On roadway construction zones, temporar y bollards can be placed to define and protect the work area from traffic. These bollards are usually made of flexible brightly colored plastic ringed in reflective tape, and sit on removable rubber bases. They are usually spaced closely, to provide a continual visual edge to the oncoming traffic. Security bollards are also visual guides to pedestrians and traffic, but are additionally built to resist vehicle impact. Many security bollards are made of steel and filled with concrete, but can be decorated with the aesthetics of an area in mind with either paint, or for a wider range of styles, with bollard covers (link down). In general, the substrate and installation of security bollards are essential parts of their impact resistance: a strong bollard set poorly will offer little resistance. Engineering oversight is therefore essential for impact resistant bollards. Different applications will also have different impact resistance needs. Playgrounds near parking lots, parks beside sharp bends in the road, outdoor patios by busy roadways: these are just some of the places that security bollards might help prevent an accident from becoming a tragedy. Steel-and-concrete bollards in a variety of widths can be matched to the vehicle speeds and distance of pedestrian zone to roadway. Safety bollards are often installed in front of vulnerable building components to minimize damage in the event of an accident. They are not usually designed with the idea there will be purposeful attack against them, so are often specified with suggested diameters of steel pipe to be filled with concrete. In some jurisdictions, vulnerable gas or water meters are required to have security bollards in bright colors installed as barrier posts around them. Similar bollards are often placed in front of vulnerable or historical architectural features that would be unlikely to attract hostile attention but may be vulnerable to vehicles out of control. Ram-raiding is a version of “smash-and-grab” burglary in which a heavy vehicle is driven through the windows or doors of a closed shop so that the perpetrators can loot many high value items in a short period of time. Security bollards are an affordable way for these locations to prevent the possibility of ram-raiding. Unlike purely decorative bollards that visually delineate pedestrian areas in retail spaces, ram-raiding security bollards are designed to prevent vehicle access to the store front. However, since ram-raiding bollards are usually part of a shopping space, they are usually given pleasing decorative covers, so they are not an architectural eyesore. After the Oklahoma bombing and the attacks on 9/11, governmental bodies became increasingly interested in developing systems to “target harden” buildings that might be under threat of criminal or terrorist attack. Bollards do some of this work without creating an oppressive, bunker-like atmosphere. The State Department introduced the first crash test system, known as the K-Rating, which is still commonly referred to although the technical standard has since been replaced by the ASTM crash rating. Either rating system is designed to measure the crash penetration of different vehicles at different speeds. At the highest level of terrorism prevention, bollards are created to withstand several waves of vehicular attack. Bike bollard R-7591-B provides security and flair in front of a storefront. Bicycle parking bollards take a cue from the mooring function of marine bollards, providing a hitching post for safe short-term bike lock-up. They often have a post-and-arm shape, where two bike-locking-arms circle the central post. Modern designs sometimes feature channels that go right through the post, specified to allow u-locks or chains. Bike bollards do double duty for the organizations and businesses that install them: like all bollards they help with vehicle or pedestrian traffic management, but they also attract cycling customers, encourage sustainability, and reduce the obstruction and damage that can come from improperly parked bikes. Asset protection bollards are devices that are used in indoor applications to protect retail property and personnel. They are generally constructed of stainless steel or composite plastic. Common uses for asset protection bollards include securing the corners of refrigeration units, warehouse racks, ATMs, and retail shelving. They are effective at warning personnel and customers of potential danger. Asset protection bollards are typically only installed with anchor bolts and therefore do not provide a high level of impact resistance. They are designed at most to defend merchandise from carts, dollies, and hand-powered cleaning equipment. When designing a bollard installation, whether primarily for pedestrian zones, traffic management, safety and security, or asset protection, there are a wide variety of aspects to consider. What is your budget? What materials work best given climate and needed function? Do they need to be removable, retractable, or are your bollards permanent landscape fixtures? If struck by vehicles, should they bend, shatter, cause damage, or stop the vehicle? How will your bollards fit in with the landscape or architecture? All these aspects go into to consideration for your bollard design. Bollards have a marine and military history, and from these roots they have developed traditional, formal designs that compliment many architectural styles. 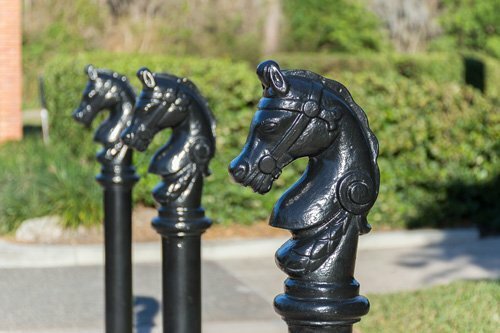 Often these traditional bollards are finished in black and made of iron, and are a highly decorative part of the land- or street-scape. Even if these traditional bollards are not installed in a way to be impact resistant to vehicles, they still provide a solid and serious looking profile and can be an assertive visual deterrent. Architectural bollards are an attractive part of the landscape. Contemporary architectural styles often require modern bollard design. Bollards come in a variety of lengths, widths, colors, and materials to match any image. Whether a sleek stainless-steel bollard outlining a pedestrian area by a stadium, a set of pebbled concrete bollards protecting a shopping plaza, or a tall yellow plastic bollard guarding an external gas or water meter, a wide range of bollard options give planners many choices to suit their site. Bollards powered by solar panel or set onto an electrical grid can be installed to provide light along pedestrian pathways. Bollards used for vehicle traffic are not generally illuminated, since bollard height is too short to light a large enough area, but reflective surfaces are common in traffic specific applications. There are recent, innovative designs that enable bollards to be a more active aide to management of the roadway. Martello bollards, inspired by the Martello towers on England’s coast, and bell bollards, shaped with the curved profile of a tower bell, have a traffic facing slope designed to protect sidewalks by catching vehicle wheels and returning them to the roadway. As they are such a common element in modern landscapes, bollards have become a focal point for artists. Some artistic bollards are designed for extra impact, like bollards designed to look like children in school zones. Other bollard designs are purely whimsical or uniquely decorative. 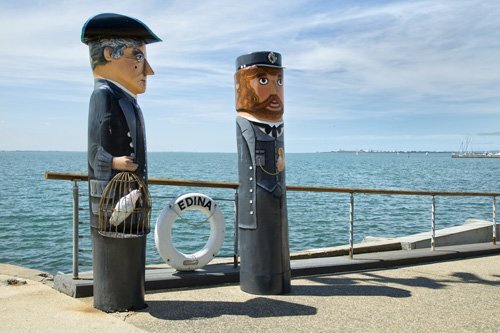 Geelong Australia’s carved bollards are a tourist attraction. Horse head tops bring artistic distinction to these path markers. No damage is done to vehicle or flexible bollard on impact. Flexible bollards are designed to do no damage to vehicles that hit them. Polyurethane bollards bend on impact with little injury to either car or bollard, popping back up after the vehicle moves away. These flexible bollards are often found in parking lots, used as parking stall poles or guiding traffic. Clipping one will tell a driver to get back into position, but will otherwise not slow or stop the car. They are occasionally used on medians or as lane delimiters. Knock-down or rebounding bollards are not flexible in the bollard body but rather sit on flexible bases. The bollard post is often made of hard high-visibility plastics and are designed to be easily replaced if damaged by vehicle strike. They’re often used as lane delineators on highways or other heavy traffic areas. Low impact bollards provide little stopping power to an impacting vehicle but would likely cause minor damage at regular traffic speeds. Many metal or concrete decorative bollards by themselves would not bring a vehicle to a stop, but they would do damage to a car’s body in a crash. Drivers will generally take extra precautions to avoid hitting inflexible, low-impact bollards even if they’re not crash secure. Low impact bollards have a wider range of installation options than higher impact bollards, including with concrete anchors, anchor castings, and bolting. Functioning on their own, or with a decorative cover, high impact resistance bollards are designed stop a vehicle that crashes into them. These safety bollards are generally constructed of deeply embedded steel pipe filled with and surrounded by cement. Engineers oversee the installation of these security bollards, to ensure that the substrate and ground around the installation is supportive of crash-protection. Most high-impact installations are designed to protect against accidents, and are chosen based on pipe diameter, given the speed and type of traffic in the area. For applications that might be undergoing concerted attack, like government buildings, crash-rated bollards are designed to withstand one or more assaults by vehicles of differing sizes and speeds. Cast iron is the most common material from which traditionally-styled bollards are constructed. It is durable and is a well-loved traditional material for ornamentation and enhancement to architecture, which makes it a top choice for many applications. Cast iron bollards are heavy enough to be used in standalone applications, or can be used as covers for steel-and-concrete security posts. Standard cast iron is not as malleable as ductile iron and is more susceptible to cracking, but provides cost advantages. Materials engineering provides us with this iron alloy that looks similar to cast iron but is more flexible and elastic. Ductile iron, also known as spheroidal graphite iron, contains a higher percentage of carbon than cast iron. The spherical shape of that carbon makes the metal more resistant to cracking. The malleability of ductile iron allows for freedom in design, allowing for detailed ornamentation. Ductile iron is also less likely to shatter on impact, thereby preventing pieces of bollards and post covers from becoming dangerous projectiles or shrapnel. This makes it a preferred choice for security bollard covers. Steel is an iron alloy that is lighter and more impact resistant than cast or ductile iron. Structural grade steel is often used in security bollards, filled with concrete, but standard steel is also commonly used to create decorative bollards for standalone applications, or bollard covers in security bollard installations. Usually, steel bollards are machined from prefabricated materials, rather than cast. If steel is going to be exposed, it is usually powder coated to make it durable and protect against corrosion. Retractable modern bollards allow for occasional vehicle access. Stainless steel bollards have a sleek, functional, contemporary look. They have a high level of weather resistance and can be used in application where weather is a concern. The metal can be left exposed in its distinguished silver-grey, or can be powder-coated with color to fit in with the surrounding aesthetic. There are two grades of stainless steel commonly used. 304 Stainless steel is often found in kitchens and bathrooms, as it is rust resistant in water and cleans well. Its strength and durability make it a common material for machined parts, car headers, and screws. This grade of stainless steel is used for bollards that are less exposed to corrosive elements. In areas that a bollard must deal with a lot of salt, whether it be marine saltwater or in areas where de-icing chemicals are often used, 316 stainless steel offers superior corrosion resistance. 316 stainless steel bollards are often chosen for their longevity. Concrete can be used in conjunction with steel pipe bollards or embedded rebar to create impact-resistant security bollards, or can be formed on its own to create attractive bollards appropriate to certain architectural styles. Whether or not a concrete bollard is installed to be impact protective, concrete’s imposing profile and inherent weight make it a clear guide to traffic. Aluminum is lightweight and malleable, making it a good choice in the design of removable, decorative bollards. If dented or scratched, the oxidization of aluminum usually leads to speckling in a similar shade, which is less noticeable than the high-contrast red rust that can develop on iron or standard steel. Aluminum is easy to cast and machine finish. Different levels of durability and hardness are achievable depending on the heat treatment used in production. Polyurethane is a polymer composite that makes a flexible bollard that is durable, UV resistant, and maintains integrity even in variable weather conditions. Poly bollards are usually installed when function and cost take priority over architectural style. Polyurethane is often seen in parking lots, along medians, and can be used for delimiting lanes. Polyurethane is shatterproof and comes in eye-catching colors, as well as dark shade for architectural applications. It is often accented with reflective tape for maximum visibility in all conditions. Stand-alone polyethylene bollards are usually found in construction and parking applications as a low-cost and low-maintenance option. Bollard covers are where plastic’s merits really shine. Unlike polyurethane, plastic is inflexible and can shatter on impact, but because of its malleability it can create the same visual effect when covering security or impact-resistant bollards. Black plastic covers can also be made in traditional architectural styles, for security posts that want some architectural flair at a lower cost than metal allows. Plastic is UV resistant and durable. Suppliers offer polyethylene bollards in both low (LDPE) and high (HDPE) formulations. LDPE is the softer of the two and its softness allows for a more ornate design. HDPE is harder and provides a longer service life. Both formulations are generally created from recycled material. Wood bollards are less common than the other bollard forms, providing very little impact resistance and being more susceptible to weathering. However, pressure treated wood bollards are sometimes selected in wooded or park areas, where the wood echoes the natural surroundings. Carved wood is sometimes used decoratively in artistic bollard installations. Breakaway installations often use pressure treated wood. Security bollards made of structural grade steel and concrete need to prioritize function over form, having a serious job to do protecting against impact. However, if these security bollards are installed in public areas, they may also need to be attractive, visible, or fit in with the aesthetic. Ductile iron, aluminum, steel, and plastic bollard covers are all commonly used to enhance and protect security bollards. These covers can make security bollards fit with traditional, modern, or high-visibility aesthetic needs, while protecting from corrosion. They are also replaceable. Many installations choose to paint metal or wooden bollards to match the surrounding aesthetic and provide some level of weathering or corrosion protection. It is an inexpensive solution that gives the installer flexibility as to color and detail. However, paint does need attention to upkeep; scratches in the paint or wear from weather and de-icing chemicals can lead to oxidization of metal bollards. For metal, a finish with greater durability is powder coating. In this process, a factory-applied powder coating is heat bonded to the metal. During coating, any bare metal attracts powder, eliminating even pinhole-sized breaks in coverage. Tough and abuse-resistant, in typical North American climates powder-coated bollards require little in terms of maintenance and deliver an exceptionally long service life. Bollards can be as permanent as cannons cemented into a wharf, degrading slowly over centuries, or as temporary as the bright orange plastic posts slung around a road crew before they start work in the morning. In changing urban areas, bollards are often required to be semi-permanent, installed so that they can be moved or removed to provide periodic or temporary access to areas, but enough a part of their setting that they need to visually fit their location. These variable bollards are usually installed with fixed mountings, so that the bollard can be moved but its mounting does not. Also known as delineator posts, temporary bollards are often used by road crews to signal traffic changes in construction zones. Portable bollards are taller than traffic cones and so add visibility to a work space. They come in a variety of high-visibility colors, and are usually ringed with reflector tape. Their rubber or plastic bases usually detach for ease of storage. Removable bollards can be temporarily taken down to allow vehicular access to normally-restricted areas. They have a base that is permanently installed in the ground in which a bollard post can be inserted and locked in place. When desired, these bollards can be unlocked and pulled out allowing access for maintenance, delivery, or emergency vehicles. Removable bollards are an ideal solution for changing access applications and are generally more cost sensitive than retractable bollards. They are commonly installed at parks, in courtyards, alleyways, and other large venues like stadiums. These bollards are available in a wide variety of materials, ranging from steel to composite plastic. There are a variety of mounting options for removable bollards in either new or existing concrete. Operable bollards are movable to allow vehicular access without needing storage. There are two major types: fold-down bollards or retractable bollards. Fold-down or collapsible bollards are installed on a hinged flange that allows a bollard to be folded to the ground. The hinge and bollard, when in prone position, are low enough to the ground to allow vehicles to pass safely over top. When in the upright position, these bollards are locked with a padlock. Collapsible bollards are generally used in applications where they only need to be lowered for the occasional delivery, utility, or emergency vehicle. When collapsed on the ground, if not well marked, they can become a pedestrian obstacle. Physical access can be given to a vehicle by unlocking and folding the bollard down. Retractable bollards, also known as telescopic bollards, are another form of removable bollard that requires no storage, but disappear entirely when stowed. These bollards can be lowered either manually or automatically into the ground. Retractable bollards are especially useful in mixed-use public spaces, as they can be raised and lowered for different events or to allow vehicle traffic. Sometimes, retractable bollards are used to grant seasonal access to places like parks that close for the winter. Manually retractable bollards are the most common type of telescoping bollard since they do not require retrofitting into existing landscapes, electrical hookups, or hydraulic systems. Receivers are installed in concrete below grade and secured with lock and key. The bollard must be unlocked to raise it from, or lower it into, the receiver, and in either position it can be locked securely into place. When retracted, the bollards are flush or have a berm to prevent becoming trip hazards. Breakaways are designed to discourage all traffic to an area other than emergency vehicles. Usually, breakaway mountings are permanently installed above grade, preventing snow plowing or other access. A wooden bollard is installed, scored just above the mounting so that it will break cleanly if run over by an emergency vehicle. The top parts of these bollards are pressure treated wood, designed to be replaced cheaply and easily. Fixed steel bollards can provide impact protection against vehicle accidents. Embedded bollards are fixed permanently into place as part of the structural site design of an outdoor space. Made of durable or stainless steel, these bollards are usually both filled with and surrounded by concrete. When installed properly, they can provide asset security, as well as being a visual guide and architectural complement. Some fixed bollards are plain posts made of durable steel and concrete that are enhanced with a decorative bollard cover. Traditional, ornate, modern, or high-visibility covers are available. Fixed bollards can also be purchased in modern stainless steel styles that do not need additional ornamentation. Bollards can be installed alone, to protect an asset indoors or out, but they are more often installed in groups. Placement is specific to the application and may come with corporate, municipal, or organizational guidelines. In general, from head-on, bollards will be spaced close enough to prevent vehicles from driving through but widely enough to allow pedestrian and bicycle access. Approaching from the side visually collapses the spaces between the bollards, drawing a line which announces the expected traffic behavior. Any bollard installation should check jurisdictional regulations to see if there are governing expectations. Some bollards, such as solar lighting bollards, contribute to LEED accreditation. Bollards are also noted for the role they play in improving public spaces and increasing livability. They are low-maintenance and do not require environmentally-harmful cleaning agents. Today, bollards are commonly designed with sustainability in mind. Environmentally-conscious suppliers offer bollards that are produced from recycled materials, including metals, plastics, polymers, and concrete. When the bollards reach the end of their service life, some of these materials can be collected and recycled again.